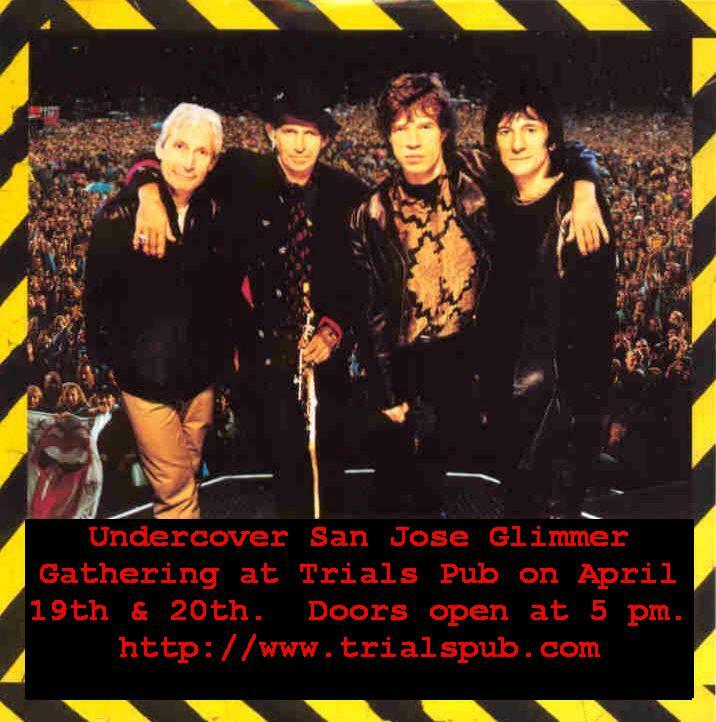 Undercover San Jose Glimmer Gathering! Rolling Stones pre concert party on April 19th and 20th!!! We found a REAL pub! It's in an historic 99-year-old building, which has been, among other things, a jail, a barber shop, a restaurant, a hotel, a brothel, and a saloon. It has a homey British atmosphere, typical British foods (as well as a vegetarian option), and many many many British beers. From experience, I can tell you they *know* how to pull a pint. To borrow from Portigal, "It's British and near the Courthouse. The Stones would love it." On April 19 and April 20, 5:30 - showtime. There is free parking nearby, and it's a 12-minute walk to the arena. You'll find a map and directions on the pub's web site. There are two parking lots nearby, both on Devine Street between N. First and Market Street. One costs $3, and the other is signposted "Jury Parking only". However, the pub owner assures me that the Jury Parking is free after 6:00. When you enter the front doors of this long building, you'll see an area furnished like a dusty Victorian sitting room. Walk in and you'll run into the long long bar. Follow the bar back, and there is an area in the rear (The "Snug"), where there are some tables, a dart board, and a graffiti wall awaiting our additions. Beer - 12 British brews on tap, 6 more available in bottles. Get ready for a 20 oz glass in your fist. Selection of wines. No liquor. See the web site for the complete list, which includes Guinness, Double Diamond, Caffrey's, Murphy's, lagers and more. See web site for menu. If you want to eat, get there a little earlier to give them time to make it! Allow about 20-30 minutes for your food. Sip that Imperial pint, while you wait. From the door of Trials Pub, walk left half block to Julian Street. Turn left. Follow Julian until you arrive at the arena, about a 12 minute journey.